Spain is a perfect destination for retirement: the climate is good for you, your pension will go further, property is affordable and it’s just a short hop back to the UK! So, how can you retire to Spain? What are the main areas to consider? Where are the best areas to retire to Spain? With Spain’s balmy climate, it’s no surprise that the southern coasts are popular destinations for retirees. And there’s more truth in that than you might expect – nothing other than the WHO itself says that the area around Torrevieja is the second-healthiest microclimate in the world, due to its sunny weather, stable climate and highly saline air. Another popular location is the Canary Islands. The region brands itself the ‘islands of eternal spring’, and certainly lives up the name! The average yearly temperature in Tenerife is 24ºC (75ºF), with summer highs of 29ºC (84ºF). Even the January low, the coldest of the year, is 14ºC (57ºF). If you’re looking for an active retirement, you could do a lot worse than the area just south of the Mar Menor. You’ve got numerous golf courses in the region, including La Manga Golf, given the title of ‘Royal Club’ by the Spanish royal household. Plus, the still waters of the Mar Menor (a couple of degrees hotter than the Med!) are perfect for a swim right through into October. For city living, the same region also has a strong contender to retire to Spain in, in Alicante. This bustling city has all the conveniences of a larger centre, but also has a very laid-back feel, with numerous beaches, bars and restaurants. Its beautiful, golden-coloured buildings have a much more authentically ‘Spanish’ feel than some of the more tourist-oriented centres. There’s a strong expat community, but also a strong local community, so it’s a great place to integrate into the Spanish way of life. A big aspect of making a success of your plan to retire to Spain is sorting out your finances. First up is drawing up your budget, and that means deciding what you’re doing with your pension. If you keep it in the UK, you’ll need to transfer it regularly over to Spain – more on that in a moment. Your other options are to use a QROPS (Qualifying Recognised Overseas Pension Scheme), or a SIPP (Self-Invested Personal Pension). A QROPS is a better idea if you’re moving permanently, as one would normally take ten years to show real benefit. 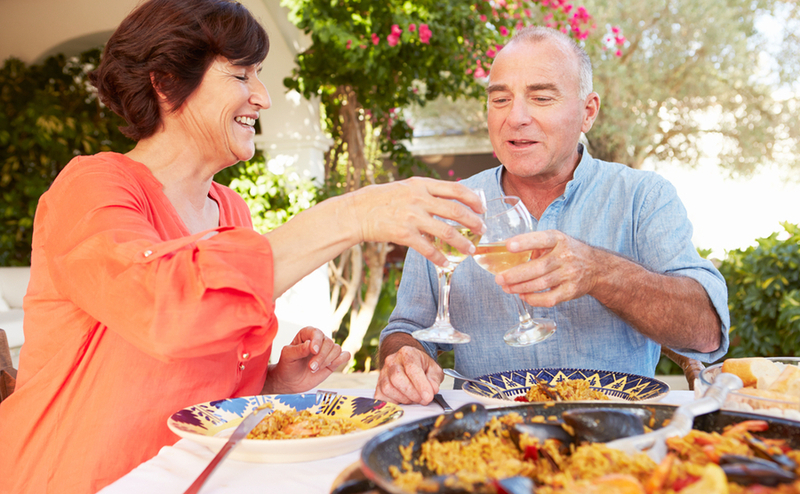 Enjoy your retirement in Spain to the full by maximising your finances. So, if you’re sending money regularly, whether from your pension or another income source, what do you need to do? It’ll mean transferring from pounds to euros, and that means exposure to the currency markets. The exchange rate changes constantly, day by day. That means that your income in pounds could be the same every month, but would differ vastly in euros. You can control this, however, by locking in the same exchange rate with a specialist ‘forward contract’. You can find out more about how this simple process works in the Property Buyer’s Guide to Currency. Healthcare in Spain is of an excellent quality. In fact, it’s been consistently ranked as top in Europe for a number of years now. In a way, the economic crisis did a lot of good for Spain, helping to weed out inefficiencies in its public organisations and drive a push for innovation and ‘up-skilling’. Generally, each town will have a surgery or healthcare centre called the CAP. Once you’re on the padrón at your town hall, you can go to your CAP and ask that you be added to the doctor’s list. Do note that prescriptions are not free in Spain; the payment largely depends on how much income tax you paid in the previous year. However, a lot more medicine is available without prescription here than in the UK.